A tale of assassination, murder & terrorism. Can the Globetrotters uncover a terrifying Commonist plot? As the Thames ices over and the country grinds to a halt, a scientist is found murdered in the north of London, and the globetrotters are called in to investigate the theft of a mysterious device. What they find is a conspiracy that brings the British Empire to the brink of war! In this adventure, the globetrotters again encounter the mysterious Commonist League, anarchists hell-bent on ushering in revolution through a cataclysmic war, a violent offshoot of the scientific utopian Cosmist League. This time, the globetrotters uncover assassination, murder, and terrorist atrocities reaching to the highest levels of society. But is everything as it seems? What lies behind the Commonists’ actions, and the disappearance of Nikolai Fyodorov, the mysterious Cosmist leader, in the distant Pamir Mountains? Can the globetrotters solve the mystery before war consumes the Empire? 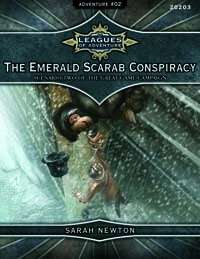 The Emerald Scarab Conspiracy is the second action-packed scenario in The Great Game campaign. Leagues of Adventure is a Victorian Steampunk setting that is powered by the Ubiquity ruleset. Hello, any news on part 3 of the campaign? This title was added to our catalog on April 21, 2013.